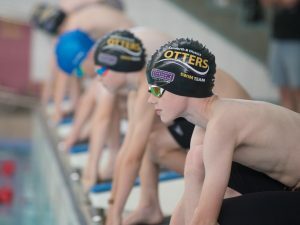 When swimming at any event, there are a few points to remember in order for everything to run smoothly for you and your fellow Otters. If you are unable to swim at a gala, meet or league event, you MUST notify your coach as soon as possible. Arrive early for the warm up. Always give your best in every race – In team events, some swimmers will do more races than others and you might not be asked to swim your favourite / best stroke. You can be reassured that the coaches will have put a lot of time and thought into it and their decisions will have been made for the good of the team. Do not wander off – you might miss your race! – If you really need to leave poolside for any reason, let one of the Otters coaches / poolside helpers know. Be positive, encouraging, and supportive to your team mates. Always be respectful to the coaches, officials, poolside helpers and everyone else – if they hadn’t given up their time, you wouldn’t have this opportunity. Never question a decision by the referee – there’ll be more races, concentrate on the next one. Wear club kit – a Carnforth Otters club swim cap and T-shirt on poolside, please, and preferably BLACK costumes / jammers. Bring water and appropriate snacks. No mobile phones / iPads etc on poolside and definitely no photos – screen games within an hour of competing can have a negative effect on performance! Act responsibly – you are representing the club.